Further investigation through the use of your knife handle seems to reveal that the glowing orb is not apparently harmful, but it has some magnetic properties, as the small amount of metal still present at the base is drawn to the ball. No ill effects seem to befall the handle otherwise. ?? ?revived: Tell the other pirate to cautiously pick up the orb. Demyx: Hey, Larsen is awesome! Pick it up yourself. Leon: ...right before it disintegrates his hand. Everlast: They must be in a bigger room now because the cave ceiling has dissapeared. Demyx: I guess. Its funny how Loofiloo didn't post one yet... Usually Loofiloo posts evry night, sometimes 2 a night. Yeah, I try to make one update per day, but I've been a little sidetracked working on a project the last couple days. I made this spiffy title image for the story (also as a project in my Web Page Design class). The pirate's machete and sack are seeing more glory here than they ever have. Everlast: That's very good. Did you use paint for that whole picture? Well, it's been a few days, but here's (finally) another update. I got in some trouble for "acquiring" Fireworks from the internet. I'd buy the program, but seriously, $300 is WAY too much for one image-making program. Anyway, I've uninstalled it now. I might ask my web page design teacher if there's a way for me to get a cheap educational copy (it worked for getting a copy of Windows XP) and then I MIGHT just make Fireworks images instead of Paint. We'll see how it works out though. It might be difficult getting used to a new program, but boy, it sure would be nice to always see the pirate like he appears in that title image, eh? It'd be like seeing the story in hi-def. 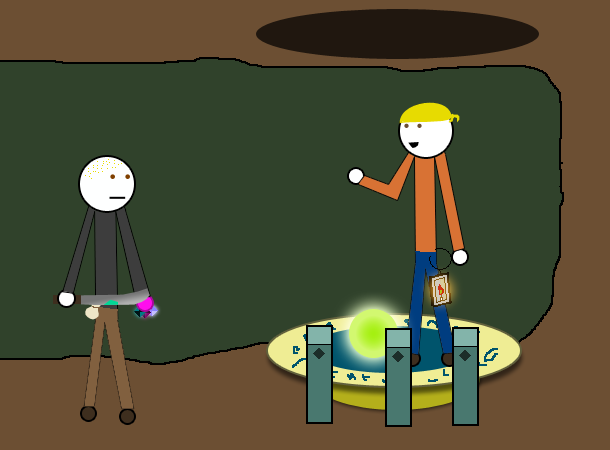 Larsen willingly picks up the orb, and it seems to do him no harm, so you go on your way down the cave. Not too far down the path though, you seem to have found the end of the cave. There's a strange platform with a glowing blue center, and a few pedestals along the side of it with glowing jewels in them. Larsen says "Boy, this place sure is mysterious. Should we take these jewels, or do you think we should try messing with that platform?" jstrok7: I see that blue orb is placed in first pedistal (It's the only pedestal that's glowing), so place green orb in third pedistal and place pink orb from your hand to second pedistal, after that, walk into that platform along with Larsen (It will probably get us out of cave) . Demyx: Loofiloo, I know you wanted to take a break from this for a while, but when should we be expecting you to come back and do this? It might be a few days yet. I'm reinstalling windows on my computer, as well as trying to learn to use Photoshop. If I can figure it out, I might switch to that program instead of Paint. Things would definitely look better. Maybe I'll do it tonight though, since I'm actually keeping people waiting, apparently. Demyx: Mainly me, I loved it. Can I reserve the next spot? PJ_69: It is a great adventure. Not being picky or anything, but will there be an end? I am just curious to see if this adventure is never ending. It may or may not have an ending... I'm not sure yet. It'll depend on whether or not I think the story has gotten too bland or boring. So anyway... There were complications with the reinstalling of Windows last night. I thought I could be done with it in an hour or so, but... Long story short, I probably can't even use my computer until tonight. It is a great adventure. Not being picky or anything, but will there be an end? I am just curious to see if this adventure is never ending. PJ_69: That will depend one thing, if you are first. You take the few gems off of the pedestals. Larsen says "Hey, you want to give me a couple of those?" And the platform nearby stops glowing as well. Even the text has darkened now. You're a little rusty on your ancient runic languages, but it appears to say "Any resemblance to existing magical devices or crystals is purely coincidental, and not subject to copyright." ?? ?revived: Tell Larson to drop his orb on the platform. Demyx: WHAT? I don't get it, is that bad translation or what it really says? Everlast: I guess that means that there are only 3 real crystals and that any others are fake. Demyx: Maybe its the stargate thing... Because its so Stargatish. PJ_69: That statement means that he cannot be sued by companies who copyrighted crystals that look the same. Demyx: Can't you feel it in your bones we should but the crystals back, and stand on the Stargate? Hope nobody took offense by that. jstrok7: Same as I alredy said 2 times but almost nobody payed any attention . Those jewels make that platform work and that's it . @Imposter - We all see that platform stopped to work so, there's no need to put orb on platform !? The orb is now set on the platform, but Larsen says "Hey, I don't think this is getting us anywhere." He then steps on the platform and says "Why not put the jewels back in for a minute and see what happens? futuramaguy42: i dont like Larsonns yellow hat so if he dosen't get rid of it soon, kill him and burn the hat. and pirate guy should step on the platform and say "alakazam"
i dont like Larsonns yellow hat so if he dosen't get rid of it soon, kill him and burn the hat. and pirate guy should step on the platform and say "alakazam"
Chang: ... how old are you? LB: Please don't go with that idiotic post! Put the gems back in after you're both on the platform! Chang: that would make sense. I like LB's idea. futuramaguy42: I even think you should not go with mine. Go with LB's. LB: Change your post then, quick! You climb onto the platform with Larsen and say what you think is the magic word. It doesn't seem to have a very desirable effect. You just hear a booming voice, probably coming from the platform say "MORON ALERT!" and then a large spring just shoots the two of you high into the air, rocketing out of the cave! 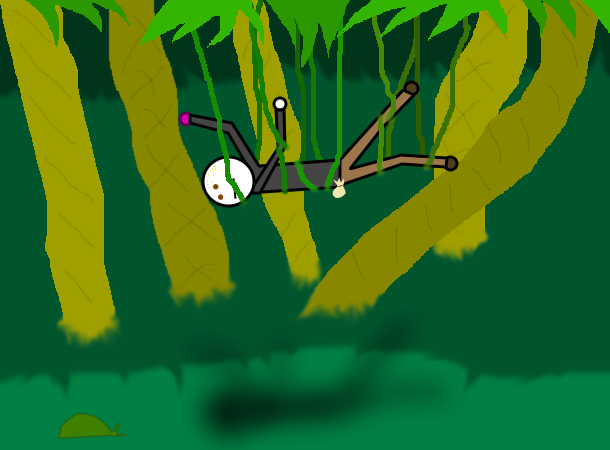 You're both flung in different directions, and you aren't sure where Larsen or the orb went, but you soon find yourself caught in a net of vines just below the canopy of trees. In addition to losing Larsen and the green orb, you can't seem to locate your knife handle, your machete, or the gems you took from the pedestal. You also seem to be missing a couple crystals, but on the bright side, it looks like you found your bandana! futuramaguy42: LOL I wont tell anymore stupid ideas. Though it was funny. futuramaguy42: Your getting angry over a game. Thats sad. Anyway we now have a bandanna. futuramaguy42: Since there are trees we can take a sharp branch. LB: You shoulhave changed your dang post, futuramaguy42! futuramaguy42: I couldn't get on my computer at all that day. I'm pretty sure they're talking about the outcome due to the last scene's suggestion. I don't really think it should be such a fuss. Without stupid suggestions, all of the Pirate's obstacles would have to be presented by me. Besides, it's not like the Pirate's adversity has a serious impact on your lives. It's just a story, folks. ;) What's a good story with no complications? On to Chapter 10: Catch That Pygmy!